"Funky," is how Maude Baum describes the state of Lark Street in 1977 when she was looking for a home for EBA, her multimedia performing arts company. Funky in a lot good ways. And funky in some not-so-good ways. Baum found the spot for her company above an old TV/radio repair shop at the corner of Lark and Hudson Ave. It's been there ever since. 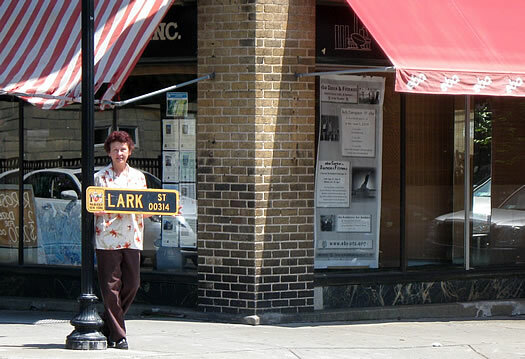 This weekend, as EBA celebrates its 40 year anniversary, 35 of them on Lark Street, Baum took time to talk with us about where Lark Street's been (eclecticism, grocery stores, an archery range, unsavory behavior) -- and where it's going. What was Lark Street like when EBA first moved in back in 1977? I think that one of the few businesses that is still here that existed back then is Waldorf Tuxedo. There was Lemmy's Market in the building where Elda's is now. And the part of Elda's that is on the corner -- that was an archery range. Wait -- a what? Was it, like a club or something? (Laughs) No, it was just an archery range. It was really only for men who wanted to do... archery. What is now McGuire's was a bar called GJs Gallery. It was the local pub and everybody went there -- legislators, transvestites, university people -- everyone. It was probably the only place in Albany I was really comfortable walking into back then. You knew nobody was going to hit on you and you could have conversations or argue about politics. It was just a real melting pot of all of the people that were around here and very funky. Hippies and legislators were comfortable with each other, it was great. I don't think there's anyplace quite like that here now. Things are so compartmentalized. Justin's came in, but back then it only took up one side of the building. It was excellent dining, but not fine dining. Excellent seafood chowder. All the dancers were poor, so for lunch they'd give us a loaf of bread and a huge bowl of chowder for $1.50. It attracted a lot of people because the dancers were there for lunch everyday. It was the kind of place where you could walk into the kitchen and ask the chef to make you something like Veal Oscar, and he'd make it for you. Cafe Hollywood used to be a pottery manufacturer. Then it became The Beverwyck for a while -- which was fine dining. The Larkin was at the other end of the street, and back then it was where the old people went -- the bartender was like 100 or something. Later it changed and the food got better. Cafe Vero and Bombers were part of a mom and pop tavern called Carps -- a wonderful seafood place that made the best stingers in the world . When the owners retired it changed hands like crazy for a while. And where the EBA entrance is -- that was the Radio and TV Hospital. It had been there since 1953. It was originally just the Radio Hospital but as TV got big it was owned they added radio. We cleaned out the basement when they moved -- there were probably 200 TV skeletons of all sizes. So was Lark Street better then, or is it better now? The neighborhood is beautiful now compared to what it was. It still has a little bit of a weird attraction for the underbelly, but not anything like it used to. Back then there was a prostitution ring that I got so upset about one night, I had our building manager cut the pay phone they used right off at the base. It was children, and it was horrible. I'd sit on the porch on a beautiful night in the summer and a car would pull up and a beautiful little girl or little boy would get out of the car and half-an-hour later they'd leave. And the police weren't doing anything about it? It was a different time back then. Lark Street had a different relationship with the police. This was a place where they would let everyone do their thing because at least they knew where they were. It was just a different era. Back then the BID [business improvement district] was being run by older people -- some were here in the 30s, 40s, and 50s. I wasn't down here in the 40s, but to give you an idea of what the neighborhood was like, the building where EBA is was the home of Mrs. Munson's School of Proper Dance. All the young kids growing up in Albany -- Mayor Corning, the Rockefellers -- they all went there to learn how to dance and to ask someone to dance and wear the proper clothes so they'd know what to do when they went to cotillions. It was open from the 30s through the early 50s. But all of that had changed. The buildings on Hudson had been red-lined for the plaza project. All these buildings were supposed to come down and a tunnel was supposed to go through the park to the plaza. The insurance companies had gotten the word that they were going to be town down. About 90 percent of the buildings on Hudson near Lark were boarded up. It was really horrible. Our company was in an awful space on Central Avenue. Our art encompassed all the new stuff about art that was happening in the 70s. Nobody had a computer then, but the media-arts movement was starting. Video, sculpture, mime, music -- performed electronic stuff -- we combined all that. We were using the mainframe at RPI to create the art we were doing. It was hot stuff at the time -- really hot. We -- and artists like us -- were the forerunners of places like EMPAC. Eventually when more people got computers we became less about cutting edge technology and more about performance art. But back then we knew we wanted multi-media to become a genre when nobody wanted to do it. Our Central Ave space was so small and dingy. We had outgrown it. And my friends told me people would come to areas like that to find art -- and they did. I fell in love with the building immediately, but the neighborhood was really rough. But I'm one of those people that has always felt that I can change the world As hokey as that sounds I've just always had that feeling that art is that powerful. Not my personal art -- but art -- is that powerful. And I really thought staying here was my part in doing that. So, did you change the neighborhood? I think we helped. I think having a theater -- an arts organization -- in the middle of the area encouraged people to come here. And we always encouraged them to go to the restaurants and shops. When parents came to take kids to dance classes we'd tell them "there's a flower shop and an ice create shop and other things to do." In the early days we'd have coupons in programs, so with your EBA ticket you could get a free drink or ice cream cone. There was a community sense of building Lark Street up. I was on the BID back then and my big thing was that the street has to be clean and look beautiful. It has to be family friendly and diversity friendly. We cut out ramps on sidewalks for the handicapped, we had flowers on the pole, lights on trees in winter -- anything to make it feel like someplace you wanted to be. Then we had to work on getting the critical mass here so there was activity on the street. And it went up and it went down and up and down. Are we at an up point now? We're in an up right now. Right now the BID is moving in the right direction. We have a natural foods store, and we're going to have a Polish grocery store. There are places like Crisan and the Wine Bar and Bistro and Spa Virgo that are doing well and they've been able to make it here. When entrepreneurs are able to survive here, I think that's an indication that an area is successful. I see people coming back from the suburbs and buying property in the neighborhood, and people who live in the neighborhood are invested in the neighborhood. For a while we had a lot of absentee landlords and a big transient population. We have places for sale and empty on the street which is not a good sign. The BID has worked very hard at getting more parking. I see the old Planned Parenthood building and I wish the city wold put in a boutique hotel or some shops with parking in the back. But overall I think things are going well. But after 35 years you're going to sell the EBA building? We put the building on the market because I need to transition this company, because I'm not going to be here forever. It's listed for $1.5 million. The building was owned by the Daughters of the Eastern Star. Before that there was a grain barn there and when it burned the owners gave the property to the Daughters. It's the only building like it in New York State, but other Eastern Star chapter houses around the country have the same architecture. When they sold it the building was on the market for 10 years before I bought it. The company isn't going anywhere. We've been offered space in all kinds of other places. I love the building, but too much of our money is going into the building when it should be going into programming. EBA celebrates its 40th anniversary this weekend with spring salon shows on Friday, Saturday and Sunday nights at 7:30. Admission is $20, $15 for students and seniors. 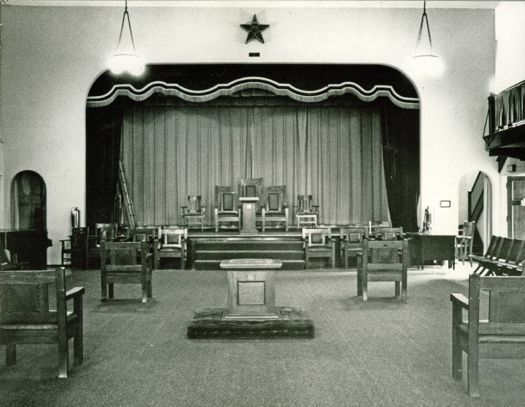 The historically curious might like to know that the Order of the Eastern Star moved to space in the Masonic Temple down on Corning Place behind City Hall. Some of the furniture in the old picture moved along with them and is still being used. I think the place that used to be where McGuire's is now was called "JG's" not "GJ's". I could be mixing up the name with the pizza place that used to be on the corner of Spring St though. This is amazing. Best AOA post ever. Thanks guys. Great post. History is priceless. Makes me sad Sunmark's Stories and Gables ended up so low in the votes. Can't beat cheese I guess. Again, great post. Interesting post. But I was hoping to see more photos of Lark Street from 35 years ago. Great post! Love the history of Lark St. and eba! Maude Baum is an inspiration to all! thanks for this! ahhhh how i wish there was a place like GJs today! reminds me of that snippet in ironweed when the swells & the bums are all together in a bar. "the difference between a bum and a swell is that bums like to dress like bums and swells like to dress like swells." tess's tavern was another classic community joint that i miss dearly. i'm loving having eba as a neighbor! the african dance class on wednesdays is phenomenal and the show this weekend is sure to be a blast. I've known Maude for 34 of the 35 years during which she's been on Lark Street. Like Lark Street itself; eba; and the building in which eba is housed, Maude has managed to transform her ideas from rudimentary beginnings through a long career of hard work, culminating in elegant maturity--at all times maintaining an ethos of integrity, enthusiasm, and community spirit. Good luck on your next move! Great post!! Like Ellen, I would have like to have seen more photos of Lark Street from 35 (or more!) years ago. This is awesome! I'd love to see more of these first-person accounts of Albany neighborhoods. I'd especially love to learn more about Pine Hills and Arbor Hill--they seem to have moved in the opposite direction of the upward trajectory of Lark Street. I'm surprised that there was no mention of 288 Lark when it was a punk/alternative club. So many good shows happened there. JGs was the pizza place on the corner of Spring St. McGuire's was previously the State Street Pub, which I think opened in the early '80s. I would also love to see pictures from 288 Lark in its heyday. No place like it. Who remembers Cathy's Waffle Shop? I used to hang out at the old Lionheart 10 years ago (wtf!) back when it was above Bombers. It was such a little neighborhood joint back then. I met many friends there that I still talk to today. I am obsessed with old Albany photographs, especially Center Square and downtown. The more the better. Seriously, just post everything you've got. @Summer -- I loved the old Lionheart. Every time I go to Bombers I look at the tables near the window and think "that's not right, there should be gross old couches there." This is a great oral history of Lark Street and EBA is a wonderful example of how the arts can help revitalize a neighborhood. It's sad to hear that EBA will be moving but it is true that old buildings are expensive to maintain. Hopefully the new owner will make a positive contribution to the neighborhood. Best of luck as EBA moves forward! 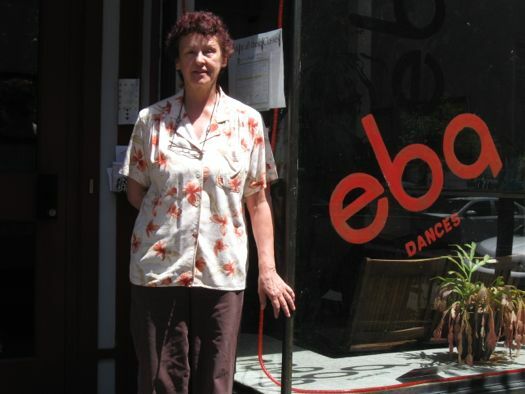 When I first moved to the area in 1988, Maude was the first dancer/choreographer I met. She and her efforts to maintain a company, classes and facility are inspiring. She's made it through the toughest of times. The sale of this wonderful building will be an end of an era. But I'm sure Maude will keep on dancing! The wine shop on State used to be an awesome ice cream joint called Scoops, which I believe went out of business when Ben & Jerry's moved in. Before it was Elda's, we'd always go to Lemmy's market. Years before that, there had been an ice cream shop and florist in the building-- my great-great grandma Madeline worked there. Oh and my young mom and her friends bought a lot of the wardrobe at the awesome vintage clothing shop, Special FX, which was right on Lark before it moved to Quail and later closed. The stretch of Central Ave by Lark used to have so many cool places too- the Music Shack, Drome Sound, the old Woolworths. It's amazing to me how much the area has changed just in the three decades I've been alive. 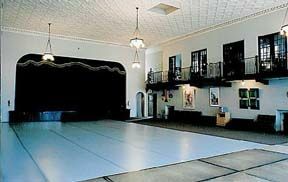 The eba upstairs theater/dance space suprised me the first time I climbed those stairs - had no idea such a place existed and was awed. Wonderful to hear an account of the history of the area. Eba was and remains a wonderful addition to the community. It's great to hear this! As a Freemason in Albany, it's very cool to see the history of Eastern Star. Those chairs are still being used in their current room!! What a wonderful article. Maude is obviously quite commited to both her community and art. I'm thinking she will be missed. @Jess: I lived many of those same memories! The area has certainly changed. If you are who I think you are, I have a couple of pictures of you with your parents when you were a baby. @Ellen - really? That's great! My parents are Joe and Susan. I am so glad to have found this post .. Maude, amazing! amazing and creative ever since the get go and to this day! or if anyone reading this is still in touch with Marsha ... a dear friend "back in the day" who I would love to get in touch with again! was back then ... Much love to an awesome lady!! great article. I grew up in this building! My parents were the caretakers and we lived in the apartment on the top floor. Family of 5. There were 3 bedrooms, living room, kitchen and bathroom. Flat style - rooms of hallway. The rest of the floor was the attic which was HUGE. We lived there from arouind 1953 to 1965. Great place to grow up - all my friends loved coming there! 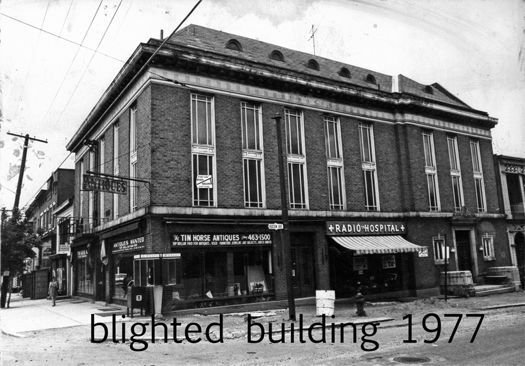 the other bottom part of the building was a pharmacy RHEINGOLDS when they lived there. I was a pest in that store all the time. You should really do a history on the Victory Cafe; (originally Ed's for newspaper reporters) and Beansie's...I have information if you want it. ..Where my best friend of 56 years now went for our lunch.. it was always a Great place to be I love Albany New York.I worked at Fay's on corner of Lark and Washington ave.waited on Mayor Corning for a sore throat gave him My Moms Home remedy .He stopped in 2 days later to thank Me.